We’re throwing an epic party (and a few freshly sharpened axes) to commemorate our grand opening in beautiful British Columbia: Surrey! It’s our NINTH location in Canada and we couldn’t be more thrilled to join this amazing community. We know there’s a few seasoned axe throwers out there and we know there’s a lot of interested amateurs—that’s why we’re offering a completely FREE open house to this great city we’ve proudly added to the Bad Axe Throwing family. There will be complimentary lessons by trained axe throwing coaches—the best and brightest on our team—and we’ll be hosting a “friendly” competition, so get your game face on! And, because we’re all about good friends and good times, we welcome you to bring your own food and drinks, too. WHERE: 109 – 8132 130th Street in Newton, just off King George Boulevard south of the Fraser Highway. BRING: Your curiosity, friends and desire to have a good time! Come on down, we’re friendly people! Being bad at something never felt so good. 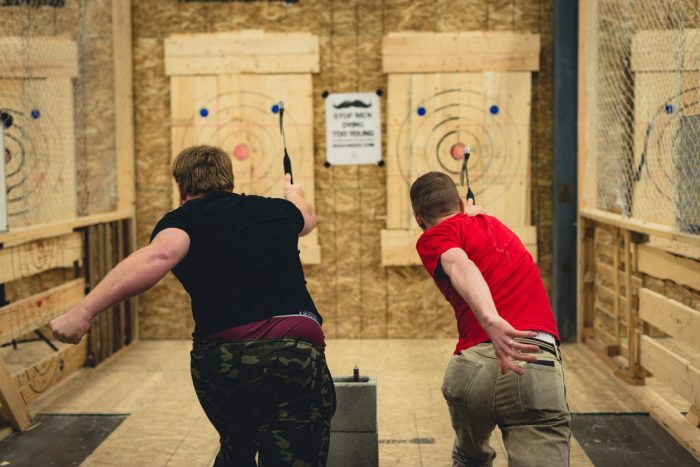 At Bad Axe Throwing, no skills are required–only a desire to have fun with a little edge. Learn how to throw an axe at a target from expert coaches in a safe and entertaining atmosphere or take your interest further with a chance to compete in the championship tournament by joining the Axe Throwing League. From birthday parties and corporate events to bachelor and bachelorette groups, Bad Axe Throwing caters to any group and celebration. Make sure you book today. Bad Axe Throwing Coming to Rochester!